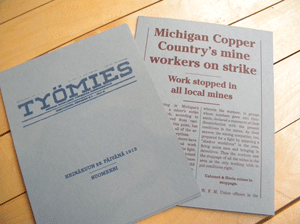 To mark the strike’s centennial, Daniel Schnieder published a broadside of Tyomies, a Finnish-language newspaper, and it’s account of the first day of the copper miners’ strike. Join Daniel as he explains the research and printing process used to create this limited edition piece, which includes the first-ever English translation. Copies of Tyomies will be for sale following the presentation.